The English language version of the UC Browser 7.8 for Symbian S60 V.1-5, Android 1.5+, Java ME & Windows Mobile touchscreen PPC 2005 and later was released last week. it can be downloaded from ucweb.com using a PC or wap.ucweb.com with your mobile browser. The Symbian V.5 download also works on Symbian^3 phones like the Nokia E6. I tried UC 7.8 on three Nokia Symbian phones; a N95-3, N8 and E6, an HTC Magic Android phone and a basic Java phone, the Motorola WX400. It seemed to work well on all the devices. 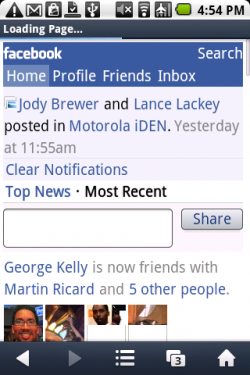 Not so with a Motorola i1 Android OS 1.5 phone where the browser installed but hung on the startup screen. I wonder if the browser really is Android 1.5 compatible as UC claims. Previous versions of UC worked well on this phone . On the E6, the UC Browser worked well with the small screen. It lets you use the Dpad to jump from link to link in mobile view. In zoom mode there’s virtual mouse pointer that you can move around the screen with the Dpad to highlight and hit small buttons, links and UI elements that tend to be hard to tap accurately on such a small screen. 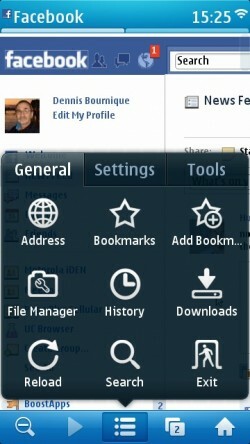 The new Android UI is essentially the one used in the touch screen Symbian version since UC 7.7. 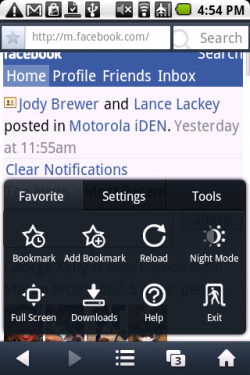 A bottom (right side on the E6) toolbar, which can be hidden if desired, gives one click access to the back and forward buttons, home screen and window menu. A menu icon on the toolbar brings up a tabbed menu offering access to settings and advanced features like clipboard management and the download manager. 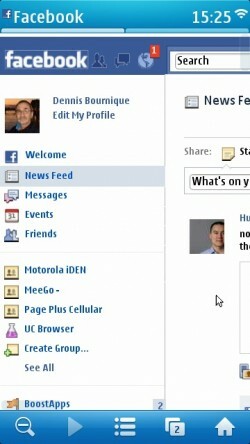 I like the UC touch menu design and find it requires fewer clicks for most actions than Opera Mini 6.1’s touch UI. Site compatibly was generally good with one significant exception, Twitter. I had no problems opening most sites. But the mobile and desktop versions of Twitter.com and third party Twitter webapps like Dabr would frequently either hang after I entered my user ID and password or throw a “403 rate limit exceeded error”. While this could have been a Twitter issue rather than a UC one, Twitter would work normally in Opera Mini and the Android browser during the time it was failing in the Android browser. Interestingly, when you put the UC browser in zoom mode on Android it uses Android’s native WebKit based direct browser engine rather than UC’s own proxy based one. As a result, rendering in zoom mode on Android is nearly pixel perfect unlike the rather messy and inaccurate rendering found in zoom mode on other platforms. The trade off is that you lose the speed and data saving advantages of a proxy browser in zoom mode on Android. Also, if you switch from zoom mode to mobile view on Android refreshing the page doesn’t actually switch the mode, you have to load a different page before the browser actually starts using the proxy engine. Although I generally prefer Opera Mini, the Opera Mini servers have been misbehaving a lot lately with web forms frequently not posting and links going to totally different sites than they should. Due to these problems I’ve been using UC more and more lately and am finding it generally more reliable, other than the issues with Twitter. This entry was posted in Uncategorized and tagged UC Browser by Dennis Bournique. Bookmark the permalink. Android represents the largest user-base for the browser, with 300 million of its 500 million total on Google’s mobile OS. You don’t paste links into the Download Manager. Normally you click a link to a downloadable file on a web page to start the download. If you have a link to a file that you copied from somewhere you can paste it into the browser’s address bar to download it. if i’m not mistaken ucweb 7.8 uses chinese proxy which means some sites ain’t gonna be accessible, like today, july 25, 2011. No no, international version don’t use proxy, today was some server issue. They posted news on twitter. The UC International version uses a proxy server in Vancouver, Canada. The dumbest browser I’ve ever known. Keypad shorcuts don’t work on nokia s40 with physical qwerty keyboard so that to navigate the pages you rely entirely on d-pad which is tiresome. Ucweb doesn’t get some sites’ laout correctly. I wonder what bulky bloat had been added to every new releases so that it gradually becomes huge but no apparent improvements introduced. However, it’s good in downloading stuff. But overall ucweb is worthless dreck. Twitter is now working fine. 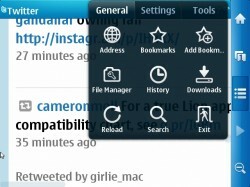 Anyway u can also use twittme.mobi UC browser is more network stable than opera mini. Have u checked Night theme? It is awesome. Only if they provide indic fonts it will be my main browser. 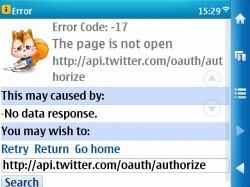 dabr.co.uk, m.tweete.net, m.ubersocial.net, m.tuitwit.com, insyt.mobi/tweet/ , tweetgo.net, hahlo.com, and m.twitstat.com all fail with “Error code -17 The page is not open” After I enter my ID and password on the Twitter oAuth page. The night theme is nice.